Our Stafford rug cleaning professionals know that Stafford rug cleaning is more than just a simple vacuuming. KIWI Services professional oriental and area rug cleaning technicians use a detailed six-step process that not only cleans your rug but they also examine your rug for needed repairs. Repairs that could extend the life of your rug for years to come! That’s why rug cleaning Stafford teams are standing by to make a difference in your rug. We only use gentle rug cleaners. Our rug cleaning Stafford team makes sure not to damage your rug in the cleaning process. Your rug won’t be dipped in chemicals or in vats of liquids! We inspect your rug even before we start – making sure that our gentle cleaning process is right for your rug. If there are holes or tears our team of expert rug weavers can help. We’re full service and even provide Stafford Oriental rug cleaning! Oriental rug cleaning has another important component: protecting the color of your rug. Many oriental rugs are dyed with natural dyes. We make sure your colors stay where they’re supposed to – no bleeding or fading with our cleaning processes. So whether you need area rug cleaning or oriental rug cleaning, KIWI is the company to call for full-service rug inspection, rug cleaning and rug repair. 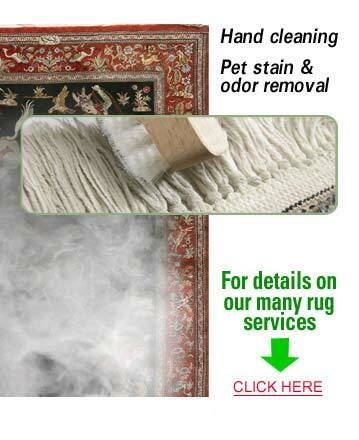 You’ll receive the best rug cleaning services in Stafford, Texas – bar none!